The most recent updates have taken Outlook from the best (as in fastest and most efficient) email app for Apple Watch to quite possibly the worst. The app is incredibly slow, it sometimes takes hours for emails to update. Further, prior to the recent updates the app used to have text at the bottom of the main menu telling you either when your inbox was last updated/refreshed or that it was currently updating, allowing you to know for sure whether the emails you were viewing were in fact up to the moment. After the updates, there is no text informing you of last update, which is particularly bad when combined with how slow the app now is—at any moment that you’re looking at emails on the watch, it is virtually impossible to know if what you are seeing is up to date, or if there are ten more emails in queue that you’re not yet seeing because of the slowness of the app. 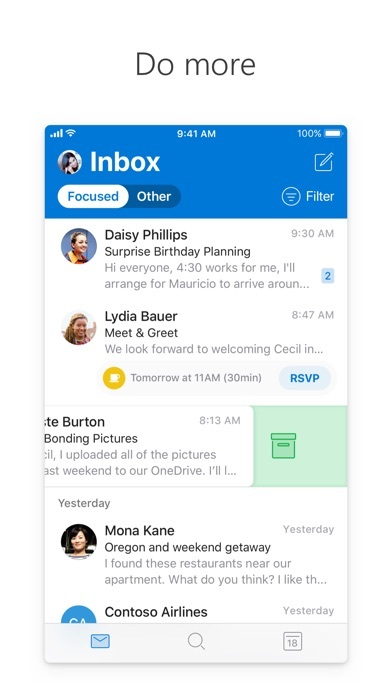 Another change for the worse: you used to be able to tap notifications of new emails and they would take you straight to that email in the outlook app. 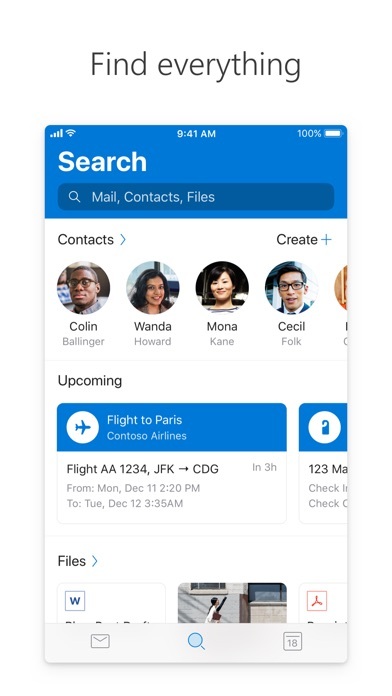 Now, you tap a notification and it takes you to the main menu of outlook, where you encounter the same issues of slowness and not knowing when the emails were last updated. In sum, your latest series of updates have taken Outlook from being the absolute best email app for Apple Watch to now being considerably worse than Apple Mail, which itself isn’t very good. Why mess with a good thing? I can’t believe i’m writing this about a Microsoft app, for the iPhone no less, but this is the best iOS email client i’ve ever used. I’ve used almost all of them, including Gmail extensively. The BEST thing about this app? Focused Inbox. 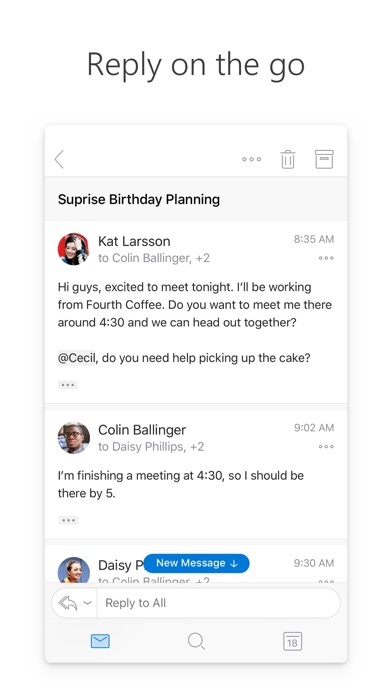 Outlook quickly learns who is important and who isn’t, and delivers notifications only for the “focused inbox” (unless you have it configured otherwise). Gmail has a version of this but its not as simple and clear-cut as Focused Inbox on outlook. I’d never realized how much time I’d spent paying attention to email notifications that didn’t require attention (receipts, work emails from other departments) - and how Outlook has streamlined my focus by reducing the number of notifications I receive. 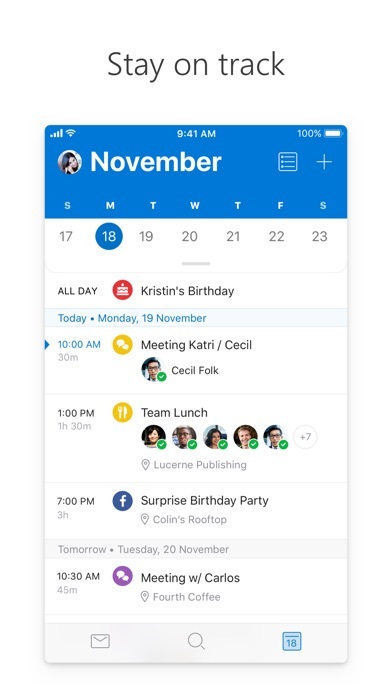 Outlook for iOS is streamlined to handle multiple accounts super well, including custom notifications per account, calendar account integration (for event creation when email content includes a date or time). The notifications themselves are even better than Mail / Gmail on iOS, allowing me to archive, reply or mark as read from the banner pull-down, without ever needing to enter the app. Even the sounds are better. I’m a believer. Gold standard. Microsoft knocked this app out of the park, but seriously, Apple? 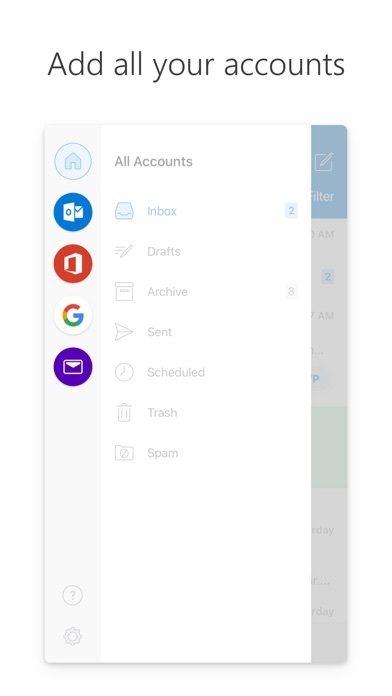 Microsoft has designs a e-mail app that is far superior to your own and you still insist on locking down your OS so no third parties can be the default app. For example, it is tiring and irksome that when I click on an email in Apple’s Safari or Message app, since I disabled and removed Mail, I get an pop-up to restore Mail and I cannot go to my email client of choice. So I have to continually go through the drudgery of copying and pasting emails in 2019 like it is still 1995. Why is Apple given a pass for this level of absurdity and other companies don’t? Microsoft continually has gotten penalized by regulatory bodies for these sorts of shenanigans when they forced Windows Media Player and Internet Explorer on us as the system defaults. I encourage everyone who truly values digital freedom to pressure Apple and your governments’ regulatory bodies to enable third-party apps to be set as default in iOS. Until then, iOS is just a toy OS that pretends to be a tool for professionals. Last update puts badge on menu and settings icon? Rating is generous for encouragement... more like 3.5 stars. Reasonably functional. No crashes problems. Lacks a lot of the functionality of other, more mature, Exchange email clients. My wish list would be for a collapsible email folder structure. Also for a contacts screen/window for viewing and scrolling through Exchange contacts, isolated from iPad contacts, so I can keep my work and my personal contact separated. Note that I use the iPad email and contacts apps for personal stuff. Annoyingly, after last update I see a badge (little gray dot) in the upper left on the nav (menu) icon. When I click the nav icon to open the left side nav panel, I see the same little gray dot on the settings gear at the bottom. Like bread crumbs. When I click this to open the settings panel, I now see there is an Add Account “1 new”. I click this (why do I need an add account reminder) then immediately dismiss it, close out of settings and go back to mail. The little gray badge is now gone. But when I later open Outlook, there it is again. Marketing people need to stay out of this.